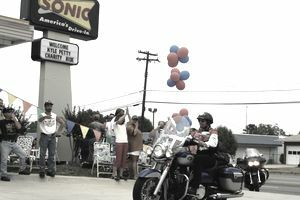 The SONIC Drive-In Restaurants version of a customer loyalty program is really four different rewards, discount, and freebie programs under one umbrella called the SONIC Fan Club. As a member of the SONIC Fan Club, loyal SONIC customers have the opportunity to participate in the SONIC Birthday Club, the SONIC Ice Cream Social Club, and to receive members-only Text Offers on their mobile device. The fourth way for loyal repeat SONIC customers to earn customer loyalty freebie rewards and discounts is by purchasing a My Sonic Card and using it to pay for purchases at SONIC Drive-In Restaurants. Here are the details about each of the four SONIC customer loyalty programs. The SONIC Ice Cream Social customer loyalty program rewards "SONIC's biggest ice cream fans with a special monthly offer." Registration for the SONIC Ice Cream Social customer loyalty program is wrapped up in the registration for the SONIC Fan Club (also referred to as My Sonic). During the registration process, joining the Ice Cream Social customer loyalty program is one of the Subscription options that new members can choose. As part of the registration process for the SONIC Drive-In Fan Club, new members who agree to receive "Exclusive SONIC News and Promotions," will be asked for their birthdate, which will make them eligible to receive a "Special Birthday Treat." This might be a freebie or a discount, depending on what birthday promotion SONIC is running when a member's birthday rolls around each year. As part of the registration process for the SONIC Fan Club, new members will be asked for two things which will make them eligible to receive "news and offers" on their mobile device in the form of text messages. Members who do want to actively participate in the Text Offers part of the SONIC customer loyalty program will first need to provide their mobile phone number. The second piece of information members will be asked for is the location of their "home" SONIC restaurant. Based on the zip code new members have provided, a list of the closest SONIC restaurants will generate. In choosing one of these restaurants, the new member will be opting in to receive "news and offers" available to them at this particular SONIC location via text message. The My SONIC Card is a refillable gift card which can be purchased at any SONIC Drive-In restaurant or via the SONIC mobile app. After purchasing a My SONIC Card, the customer must register the card on the My SONIC Card website to be eligible to receive a free food award. The terms are vague, but there's also an indication that frequent users of a registered My SONIC Card will also be rewarded with some sort of food discounts or freebies. As with all customer loyalty programs offered in the U.S. restaurant industry, the SONIC Drive-In Restaurants Fan Club Customer Loyalty Program is focused on keeping customers actively engaged with one of the most valuable brands among all U.S. restaurant chains. Headquartered in Oklahoma, SONIC Drive-In Restaurants is one of the largest U.S. restaurant companies, which affords loyalty club members the opportunity to be active repeat customers wherever they travel throughout the U.S. This gives SONIC a way to compete with other major U.S restaurant chains, and the various customer loyalty programs provide SONIC customers with plenty of reasons to choose SONIC over other fast food chains. While the variety and number of customer loyalty programs available to SONIC Fan Club members might increase the level of customer engagement, it's just as likely that the four separate and different programs might confuse customers. Without a clear focus or understanding about what customer loyalty rewards they're earning or how exactly they're earning those rewards, loyal customers might disengage in favor of another fast food customer loyalty program which has is less complicated.